Parentage/origins: Limb sport of 'Miyagawa' Satsuma mandarin. According to Saunt (2000): "Miyamoto arose as a limb mutation discovered in 1960 on a Miyagawa Wase tree on L Miyamoto's property, Shimotsu-cho, Wakayama Prefecture. 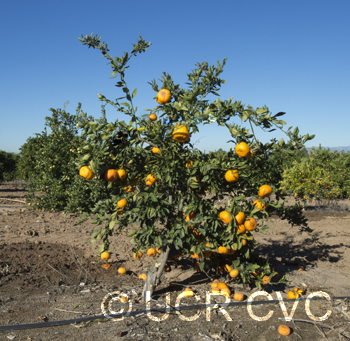 RRK, 8/69/2010: "Although thought to be virus-free when first released, it was discovered that Miyamoto was carrying citrus mosaic virus, known in Japan as 'Toromikan' (tiger mandarin) which slowed down the rapid increase in plantings. 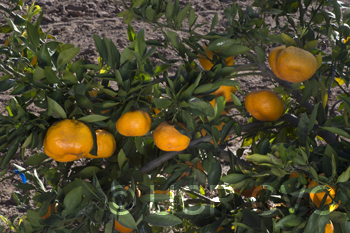 Nevertheless, Miyamoto is currently the most popular Goko Wase [editor's note: very early satsuma group] variety with an estimated 2,500 ha in production. "Miyamoto, which matures 10 days and 15 to 20 days earlier than Okitsu and Miyagawa respectively, has other superior traits such as good colour, particularly the flesh, and a high Brix level. The fruit is medium in size and more spherical in shape than Okitsu or Miyagawa. Miyamoto is reported to be a hgih yielding variety and has a tendency to set a large crop." 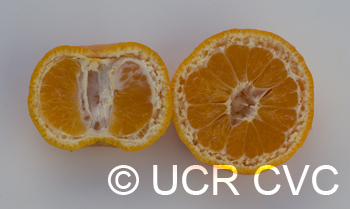 In China, the fruit is described as "Fruit obloid, yellowish orange, sizes uniformly in 5.5 cm X 6.8 cm, apex flattened, oil glands slightly conspicuous. Fruit marketing season commences in middle-late September. TSS above 8.0 %, acid content below 1.0 %. In the areas with higher accumulated temperature, it matures 15 days earlier than Miyagawa wase." September. In those areas of China with higher heat accumulation, the fruit matures 15 days earlier than ‘Miyagawa’ fruit (Deng 2008). Availability: Please refer to the CCPP for information on an approved budsource. Saunt, J. 2000. Citrus Varieties Of The World (2nd ed). unspecified Sinclair International, Norwich, England. Comment: Pp 46-37.